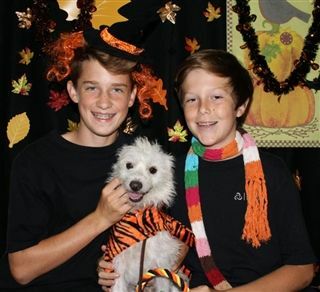 Middle School Service Learning's Animal Allies want the dogs and cats at Carlsbad's Department of Animal Services to get the sweet treat of adoption this Halloween season. Last week, students participated in a festive, promotional photo shoot that will be used to introduce these furry friends to prospective families. Students have been working with staff and getting to know the animals during weekly visits to the shelter. The group helps with feedings, cleans cages and kennels, and is learning about the homeless animal problem, spaying and neutering, responsible pet ownership and animal safety.